A Once-in-a-Lifetime Experience for Creative Heroines Who Are Ready to Bloom! Imagine strolling along ancient streets, footfalls and lively conversations in Italian echoing all around you. Red geraniums line stone window sills beneath a bright blue sky. The present mingles with the past; you sense your place in the world. Far away laughter flies on the breeze. Pale purple wisteria clings to stone archways. The aromas of garlic and rosemary waft in the air. As these sights, sounds, and smells permeate your consciousness, new thoughts quicken and rise to the surface. You begin to see a more vibrant, creative way to live your life. Your creative dream is poised for you to bring it forth. Through creative play, going deep to tap the richness of your own wisdom, and the freedom to follow your true path, you will find clarity, inspiration, and a plan to bring your vision into the world. The world wants your gifts. Come nourish your creative spirit in the land of the Italian Renaissance and share your brilliance! You did it! You built a successful life. Job, career, finances ... it's all clicking. At least that's what your friends tell you. But inside you know ... something is missing. With all your sacrifice for achievement, there's a creative side of you that's still yearning to be expressed. For years you put it on the shelf. But you just can't do that any longer. You yearn to find a way to create that frees your creativity and makes your life better! ... taking up your long-held desire to paint. ... finding a way to free your inner writer. ... traveling the world, capturing moments through the lens of your camera. Or ... it could even be finding a career that puts your creative energy front and center. Now ... there's a way to not only connect with that energy, but to build a vision and a plan that helps you to start living it! Your creative dream matters, but only you can make it real. What is calling to you that you can no longer ignore? ... have a specific creative goal, like writing a book or showing your paintings? ... know you have a creative calling, but you need help hearing it clearly? ... need to replenish your creative spirit to invigorate your life, art, writing, or business? ... long to live your life more creatively, in all that you do? This retreat is all about your creative dreams and goals. As you focus on what you can create, you step fully into the creative flow. Magic happens! Your gifts begin to blossom. You see what’s possible and bring energy and innovation to everything you do. And you make real progress on your creative dream! During my 26-year corporate career, my creative life became a casualty of my success. Although I longed to fully express my creative voice, I kept putting it off. Then, life intervened. I got sick. Soon after, I was laid off. It seemed my choices were narrowing, when in reality, much of that was my own outlook. When I began the path to reclaim my creative future, I learned to take risks to do what mattered most to me. I accepted that there are no guarantees, that it was up to me to create the life I wanted. And what I wanted most, was to express my creativity and to mentor other creatives. Now, I’m a published author, a certified Co-Active® Coach, and I’m helping creatives discover how to stop stuffing their creativity in a closet and waiting for “someday.” I’m helping them to start expressing their creativity—and even profit from it. 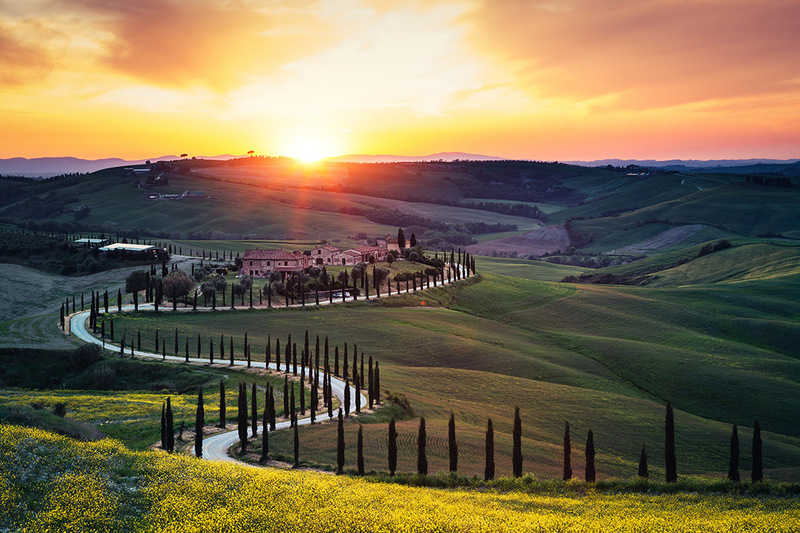 You too, can reclaim your own creative path with your first big step in Tuscany! "Julie listens with her whole being and intuition with such a fresh and fearless approach that I always feel enlightened and eager to use what I’ve discovered." Audrey W., painter. “Julie is calm, an oasis of peace, approachable and easy to talk with, contemplative and considers things from different viewpoints, gives clear advice and direction, and is warm, a pleasure to be around.”—Risë K., editor, writer, and painter. “Julie helps to solidify my thoughts. She helps me to see things from more than one perspective." 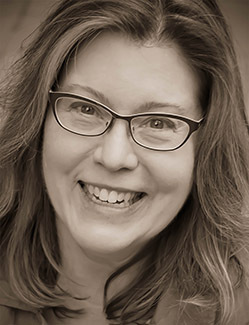 Linda M., jewelry designer and creator. This retreat has been specifically designed so that we move day-by-day from your dream to your plan to make it real. You will not only connect with your creative spirit, you will discover exactly what form your creativity is going to take. And you will come away with a plan to integrate your creative discoveries into your everyday life. So this becomes more than an awesome memory; it also becomes an inspiring way of life! Day 1—We begin to connect as a group, using powerful exercises to awaken and tap into your creative energy. This is an extremely profound process that helps you clarify your creative dream. Day 2—We take the clarity from day one and focus your creative energy into defining your creative goal—and you declare it to the group. This is where you begin to build your tangible creative path for your project. Day 3—You take the creative juju and direction unleashed during the first two days, bypass your inner critic, and play! This imaginative playground is the confidence-builder that you will come back to, again and again, as you make your dream real. Day 4—You experience a day of discovery and exploration in Siena. You partner with your subconscious and synchronicity to bring inspiration and crucial insights to what you are creating. Day 5—Using all your insights and experiences from the previous four days, you refine your creative path, mapping your creative project in enough detail to be able to follow it when your return home. Day 6—You share and commit to your creative plan. And you complete the week with a powerful exercise to unleash the deep strength and wisdom of your inner creative heroine, so you can integrate your creative genius into your daily life. Our time together will unfold to the rhythm of an Italian summer day. Early mornings are your own, to nestle under the covers and dream, or to rise and create on the grounds of the beautifully restored, 12th-century monastery—and enjoy a delicious breakfast. Our morning workshops will inspire you, replenish you, and get you into your creative zone. You will see your vision take form. A plan will start to emerge, so you can take action on it. At lunchtime, our days turn to adventure! You can spend the afternoons visiting nearby towns with other creative heroines, or exploring and creating on your own. Stroll along sun-dappled, cobbled streets. Write, sketch, or people-watch at a café. Discover your favorite gelato under the warm Tuscan sun. 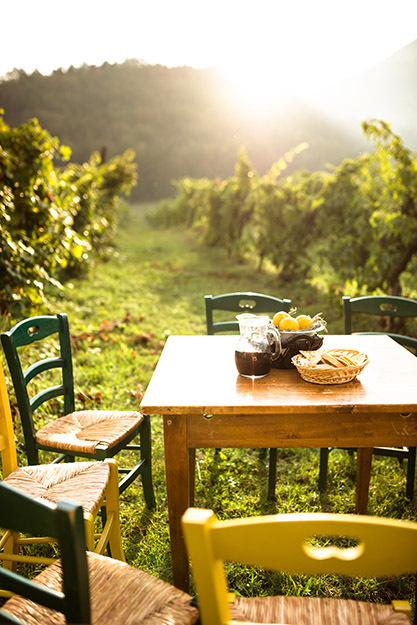 As the sun lowers in the sky and the light softens, we will gather back at the monastery for an authentic Italian dinner and lively conversation. 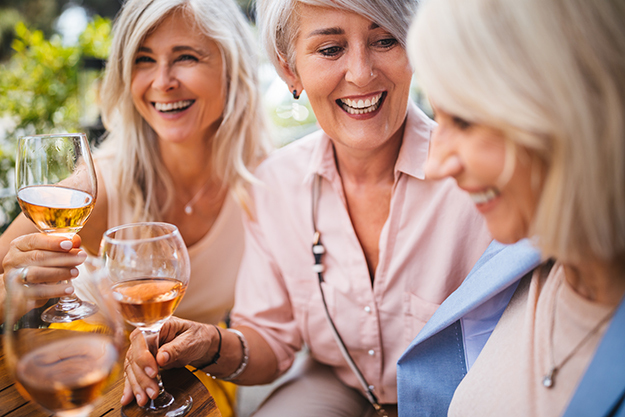 In the evenings, you can convene for more wine and connection, go to our shared space to create, or retire to a quiet space alone to journal. And one of those evenings, you will have a private session with me to help you discover your next steps! Nurture Your Inner Creative Heroine to Shine! This is just some of what to look forward to during your six glorious days in Tuscany. You are a creative heroine—and I love mentoring creative heroines! You get three, private creative mentoring sessions with me before, during, and after the retreat. To move your further, faster, you get your own Creative Heroine’s Path™ Guidebook, with exclusive material designed just for this retreat. Part creative workbook, part art journal, it guides you to explore what’s calling you, design and map your creative path, and capture meaningful moments and insights in words and images. Our interactive exercises help you dive deep and get clear. Like physical exercise, they warm up your creative spirit and get you into the flow. The beauty in these experiences is not only hearing your inner genius, but discovering the wisdom of other women, too. We all have so much life experience, depth, and insight to give. When we share with each other, it broadens our learning. We feel supported and heard. And we believe in one another, which helps us believe in ourselves. These are a just few of our creative projects that will help unleash your creative juju. Visionary collage, where you create with images, words, textures, colors, and then find the hidden message in your own art. Synchronicity writing, where you tap into your subconscious and free-write based on random items and experiences from your travels. You will be amazed at what you discover. 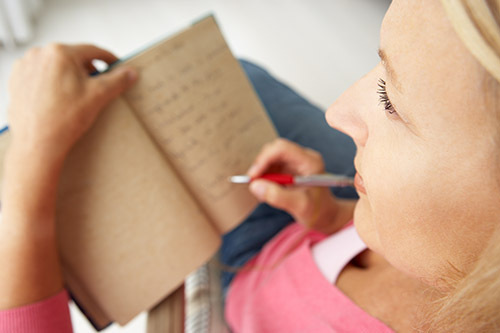 Spirit journaling, where you write, draw, or “scrapbook” pages in a leather notebook throughout the week, building your memories and insights into a tangible memoir of your experience. What Is the Cost of Putting off Your Creative Dream? If this experience calls to you, but you are tempted to put it off, ask yourself these four, simple questions. What does your creative dream mean to you? What is it worth to you to make your vision real? How will you feel one year from now, if you have made little or no progress on your creative dream? How will you feel ten years from now? This is your chance to ignite your creative spark, connect with your inner wisdom, and bring home a plan for making your creative dream real. 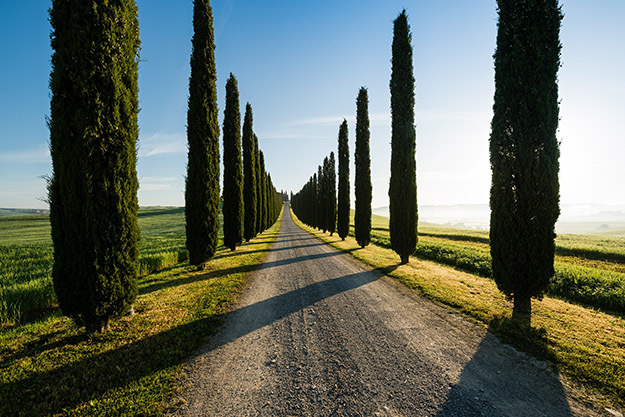 Blue skies, cypress trees, red poppies, terraced hillsides, and the beautiful Tuscan town of Radda await you. If this retreat calls to you, but you still have questions, let’s talk. What is getting in your way of achieving your creative goals, and how can I help?